While investigating the idea of how farmers markets can create quality community partnerships, I interviewed representatives from three different markets: Berea Farmers Market, Floyd County Farmers Market and Perry County Farmers Market. The following suggestions and ideas come from those conversations, as well as my personal experience selling at farmers markets and working with farmers market producers. Our Kentucky food system is a dynamic and complex system that effects each of us individually, every single day. Cornell University defines a community food system as, “food production, processing, distribution, consumption and disposal to enhance the environmental, economic, social and nutritional health of a particular place.” Our farmers markets are one piece of the food system pie in our communities. At first glance, farmers markets are a place where producers can directly sell their farm products to individuals and families in their community. Farmers markets are also a venue for community development. When farmers markets prioritize community partnership development, they are solidifying the markets place within the community as a space for economic vitality, food access, relationship building and general prosperity. Good communication is key to beginning any partnership. Expressing hopes, wants and needs is essential to understanding if a partnership between organizations is a good fit for both entities. Conversations between farmers markets and community partners can start a variety of ways: face-to-face, by phone call, or e-mail. This will vary greatly based on a variety of factors, such as how you were introduced to the partner, accessibility to partner and/or time allotment for these types of conversations. The biggest thing to remember is in order to know if a partnership is possible, you need to ask! Don’t be afraid to start a conversation and see where it leads. Introduce the farmers market > share details such as: location, vendor details, times of operation, goals and objectives…etc. How you heard about this particular community partner > through a friend, flyer, social media or other? Propose idea for partnership > What activity or program will happen because of this partnership? What is the time commitment? Will this happen once or be reoccurring? If a partnerships seems likely > schedule a time to meet and include other market members to begin planning. 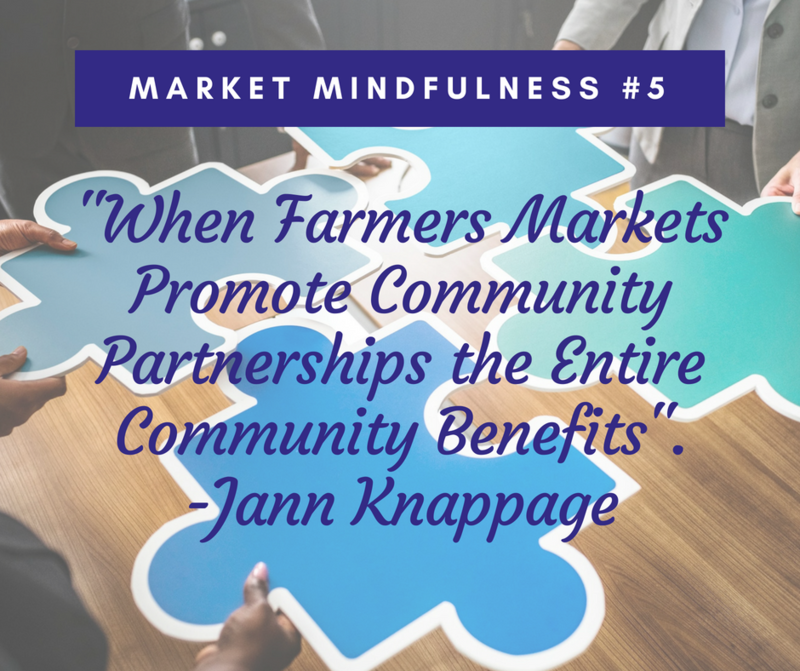 Each of the farmers markets interviewed agreed that many of their successful community partnerships occurred when the community partner approached the market first. This showed to the markets that the potential partner was proactive and interested enough that they initiated a conversation. This made the markets feel secure and created initial trust between the market and potential partner. Without the initial partner enthusiasm, markets were still willing to collaborate, but feared the partnership would end up being one sided and add more work for the market manager and/or market producers. Markets agreed that the partnerships that felt the most natural were always the most successful. Things that lead to this natural flow were: mission’s aligning, common food access goals, mutualistic promotion, and shared enthusiasm for programming. The interviewed markets agreed that any collaborations that felt forced or one sided were never successful. Members agreed that when this happened, they forfeited their efforts and moved on with no hard feelings, but positive other partnerships can be made. Listed below are examples of ways community partners are currently being utilized in Kentucky farmers markets. Several KY farmers markets host local musicians at their markets. This draws people to the market, as well as promotes the musician. It can create a welcoming and relaxing atmosphere for market participants. Has been known to provide fiscal sponsorship to their local farmers market in several Kentucky communities. As emphasized above community partnerships can take many forms and are unique to each farmers market. Community partnerships are essential when the goal is to make the farmers market a vibrant and successful entity that promotes “economic vitality, food access, relationship building and general prosperity.” Get creative and engage a variety or individuals and organizations from healthcare centers to summer feeding sites to fitness groups. When looking for community partnerships, the sky is the limit. I challenge you and your farmers market to make one (if not more) community partnership(s) this market season!